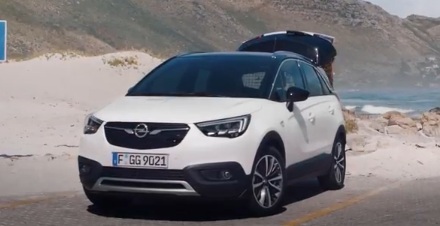 Opel has released a new commercial, highlighting that the Crossland X is the perfect fit for your lifestyle, with its SUV design, exceptional versatility and lots of storage space – for whatever your day brings. “Everyone needs their own space. The Opel Crossland X makes your life more flexible”, says the voiceover in the spot, specifiying that, “when it’s more than just your best friend and you”, you can easily slide and flip the rear seats to maximize the boot space, which has a maximum capacity of 1255 litres. “To make sure you get where you’re going nice and relaxed, the Crossland X has ergonomic seats that help take care of your back on every trip”, adds the voiceover, mentioning that they are certified by the Campaign for Healthier Backs (AGR), which is a centre of excellence for ergonomics. Viewers are also informed that the seats are designed to fit their exact height and built supremely back-friendly, with adjustable lumbar support. The voiceover continues by saying that your most important apps and services are always on board, and all you have to do is simply connect your smartphone to the NAVI 5.0 Intellink with 8″ colour-touchscreen via USB and use voice control to navigate through Apple CarPlay or Android AUTO, so you can concentrate 100% on driving. The spot, featuring the single It’s A Good Life” by German singer Tom Gaebel, from his 2007 album “Good Life”, ends with the voiceover saying that “the Opel Crossland X fits your life and your life fits in the Crossland X”.